Former President Jimmy Carter pulled no punches in calling out war propaganda, media bias, cashing in on the presidency and U.S. imperialism. Former President Jimmy Carter pulled no punches in a recent interview with The New York Times, clearly stating that he does not believe the widespread propaganda campaign accusing Russia of stealing the 2016 presidential election from Democratic candidate Hillary Clinton. The former president opined, “we have 22 votes in our family and Obama got all 22 of them,” complaining that Obama had “refused” to engage in diplomacy with North Korea, and lamented the fact that Obama joined in the bombing of Yemen – which has resulted in massive humanitarian crisis. 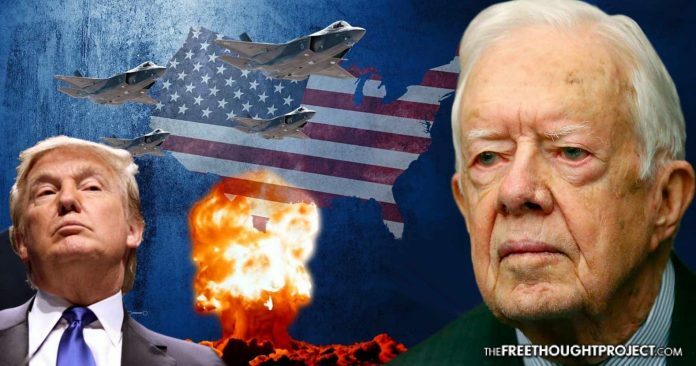 Even former President Carter, at 93-years-old, can clearly see what is transpiring in terms of war propaganda, pay-for-play politics, cashing in on the presidency and U.S. imperialism.